Basketball Bitcoin Giveaway at Cloudbet Betting - March Madness! March Madness draws near, and Cloudbet is holding a basketball bitcoin betting bonanza with 1 BTC prize! 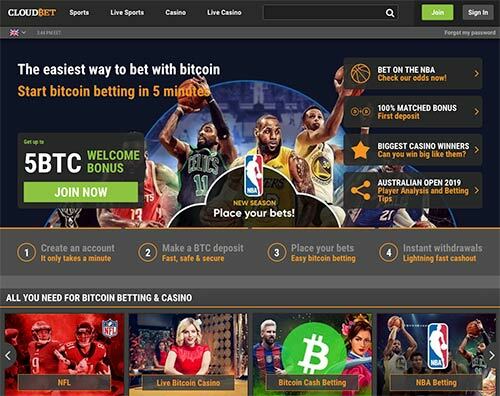 One lucky basketball fan will win 1 BTC from Bitcoin betting with just a 0.0001 BTC stake! Whether you’re an avid follower of US college basketball, excited by the NBA or anxiously anticipating the conclusion of the PBA season, then this offer is for you. Every time you bet 0.0001 BTC or more on either March Madness, NBA or PBA between Tuesday, 19th of March, and Monday 8th of April, you will receive a ticket into the 1 BTC prize giveaway. That is a 10,000x return on your investment. That’s nice! There’s no sign up or opt-in required, just place your bets on those three throughout the three week period and you will get the total the number of tickets you have earned. On Tuesday, 9th of April, Cloudbet will then randomly select the lucky winner from all of the entry tickets. If you are lucky, you will have 1 BTC sitting nicely in your Cloudbet account! This is how Cloudbet lobby looks like.